The architectural styles at Homestead take cues from the farms and ranches of generations ago, respecting and complementing the rugged Texas landscape. Clean, modern lines combine with rustic materials and native landscaping to create homes with a contemporary, yet homey feel that’s well-suited to the relaxed lifestyle at Homestead. Spacious front porches are a classic way to add curb appeal to any home. At Homestead, most homes have the option to include a front or back porch, or even a second-floor balcony. Extend your back porch for space to include a grill or outdoor fireplace, or include a front porch where you can hang a swing or fit a pair of rocking chairs. 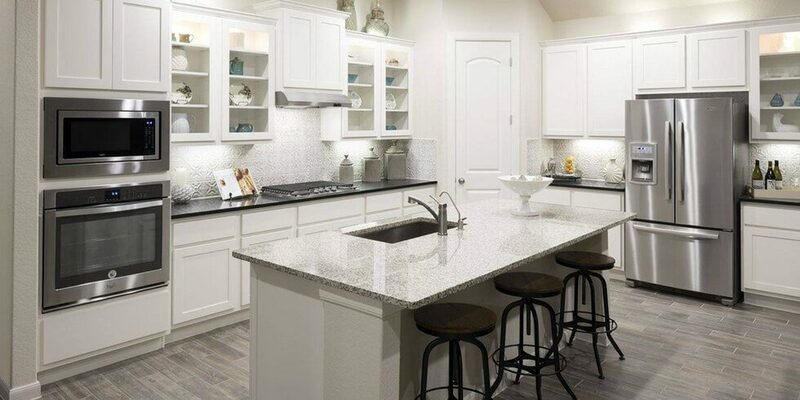 Homes at Homestead feature centrally located kitchens that open up to formal living and dining areas, giving you the best of both open and traditional floor plans. Soaring two-story ceilings make your home feel huge, and with the option to include a fireplace or wood-look tile, it’s the perfect place to cozy up for family time or invite friends over for a dinner party. For centuries the heart of the home has been the kitchen, and it’s no different for today’s families. A large kitchen island and plenty of counter space makes it easy for the whole family to help with dinner; top-of-the-line stainless steel appliances make you feel like a gourmet chef; and a walk-in pantry ensures you have every ingredient you ever need, right at your fingertips. At Homestead, you can have that classic owners’ retreat you’ve always wanted. Unwind after a long day in your spa-like bathroom with a soaking tub and marble vanity; include a bay window for a cozy place to catch up on some reading; or even extend the suite for more room to spread out and relax. At Homestead, tradition and modern amenities come together to create a quiet, quaint community for today’s families to call home. To learn more about Homestead and its unique design, visit our model homes seven days a week, and join the Founders Club to receive news and updates.